Normally a Windows feature, Information Rights Management also lets admins limit access to SharePoint 2010 documents. Here’s how to set up IRM and handle its limitations. data leaks is known as Information Rights Management. Although Information Rights Management is technically a Windows feature, SharePoint 2010 can take advantage of it as well. What is Information Rights Management and why is it important to SharePoint 2010? Information Rights Management (IRM) is designed to protect Microsoft Office documents and email messages. IRM lets admins create policies that control what users can and can’t do with a protected document. 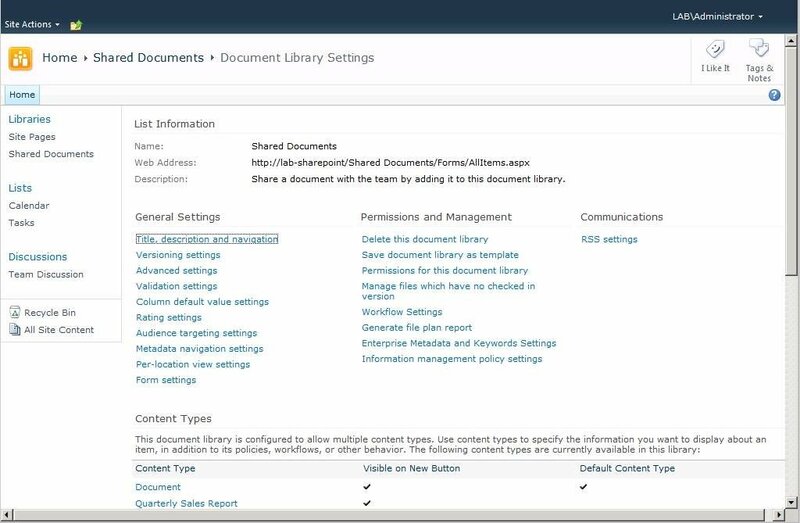 For example, if you have a SharePoint 2010 document library that’s full of highly sensitive documents, you can create a policy that prevents users from copying, modifying or printing the documents. You can even use IRM to disable copy and paste, so users can't copy data from a protected document and paste it into a new document. A nice feature in IRM is that protection settings travel with the document. That way, if a user sends a copy of a protected document to someone outside of your organization, the recipient cannot open the protected document. Despite its many benefits, IRM does have limitations. Specifically, certain types of malware -- such as keyloggers -- can steal data as it is entered into an IRM-protected document. IRM also tends to be vulnerable to third-party screen-capture programs. IRM security can also be manually circumvented by retyping the contents of a protected document or taking a digital photo of the monitor. To apply IRM to a SharePoint 2010 document library, open the library in which you want to apply IRM and click the Library tab at the top of the window. When the toolbar appears, click the Library Settings icon. On the Document Library Settings page, check to see if there is an Information Rights Management link beneath the Permissions and Management section, as it might be missing (Figure 1). Figure 1: The Information Rights Management link may be missing from your SharePoint 2010 document library. If the IRM link is missing, you must enable IRM on the SharePoint Server before continuing. David Lim wrote up detailed instructions on how to do this. After you get the IRM link to appear, click it and you’ll be taken to the Information Rights Management Settings page. Select the Restrict Permission to Documents in this Library on Download check box (Figure 2). This applies IRM policy restrictions to any documents that are downloaded from the document library. Figure 2: Use IRM to restrict permissions to SharePoint 2010 documents. Take a moment to populate the Permission Policy Title and the Permission Policy Description text boxes so you can keep track of what the policy does. There are also a number of other policy settings you can enable through this dialog box. For example, you can disable printing for some users or prevent users from uploading documents to the library unless those documents support IRM. Click OK to complete the configuration process. Always remember that not all document types can be IRM-protected. In SharePoint 2010, you can enable IRM protection for Microsoft Word, Excel, and PowerPoint documents (Office 97 and higher) as well as Microsoft Office InfoPath forms and XPS documents. IRM does not protect PDF files. In general, IRM offers a high degree of protection for documents stored in a SharePoint 2010 document library. Even so, IRM is not perfect, and it’s important to be aware of its limitations so that you don’t have a false sense of security.